One of the classes I’m taking this semester is called Youth Discipleship. It’s been an engaging class that I’ve very much enjoyed- especially because it has immediate implications for me, since I have the privilege and honor of discipling some awesome youth at EFC. One of our assignments for class was to watch the move “About A Boy” and analyze how it may relate to Christian discipleship. I submitted my paper and my professor, knowing I do a bit of blogging, encouraged me to adapt it for a blog post, so here it is. The move stars Nicholas Hoult as Marcus and Hugh Grant as Will, the main characters of this dramedy about the evolution of a relationship between a socially awkward boy (Marcus) and a man (Will) who seemingly has it all. Interwoven into the tapestry that composes the plot are a few bright threads that bring a subtle critique of the American individualism that disregards the needs of others, the struggles of an essentially parent-less boy (he has an absentee father and a self-absorbed, hippie mother) caught in the throes of a vicious social atmosphere, and the blatant apathy of of today’s adult male towards familial responsibilities. This scenario is now the norm for Christian youth workers, and we must adapt and learn to address the issues facing us today. There are 3 main principles that show promise for Christian leaders to draw principles of discipleship from: 1.) the vacuum caused by absentee fathers, particularly for boys, 2.) the mimicry process that occurs in relationships, regardless of intentionality, and 3.) the mutual transformation that occurs in discipling relationships. Within the last five years or so, there has been a lot of research regarding the male decline in society- which has lead to the question of how the church ought to respond appropriately. 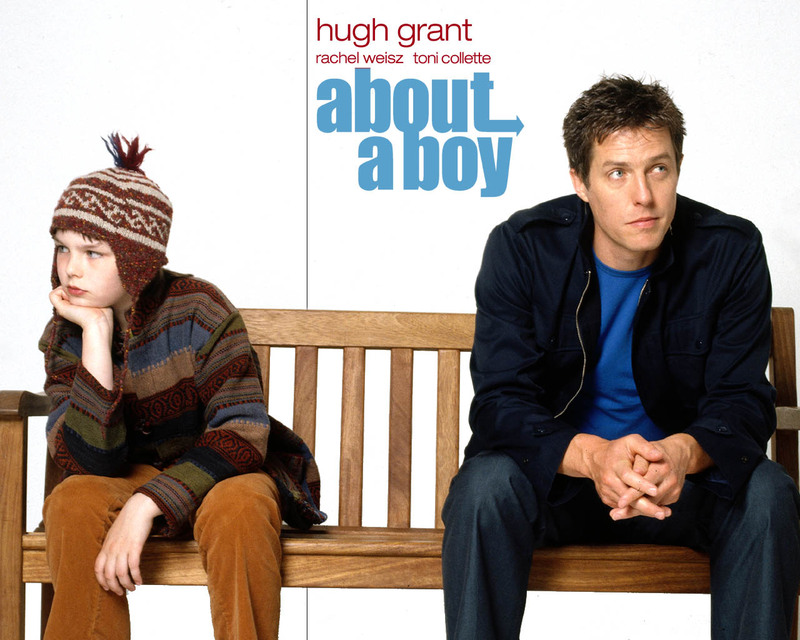 “About A Boy,” clearly shows traces of this theme, as the lead character Will has no job, no commitments, and dates casually (going so far as to join a single parents’ group to pick up the ladies). Similarly, Marcus’ father also rejected his responsibilities to his son and comes around only for holidays. This leaves Marcus with very little idea of how to relate to society, except from what he has learned from his “crazy hippie” mother. This leads us to ask, how can we help fill this gap in students’ lives, particularly the boys with absentee fathers/male role models. Much of our job is not only to teach them about Jesus, but now includes teaching them what it means to be a man in an evolving world that seems to be rejecting any sort of masculinity of old. An interesting part of the movie is how Marcus picks up Will’s mannerisms and demeanor. Marcus begins to glean social cues from Will’s interactions- even if Will did not intentionally go about teaching Marcus societal expectations. Human beings, but particularly young human beings, are naturally mimics. Infants learn by observation and mimicry, they do not understand language yet, so traditional oratory learning is impossible, it’s all mimicked learning. This means that the actions of Christian leaders will likely be passed on to our students- both the good and the bad. This is a powerful tool that can either lead to particular harm or good- if used well, a leader can do positive discipleship simply by being rather than actively pursuing a goal. This leads to stronger affirmation for the student because they do not feel like a project, but rather feel like a valuable human being. Alternatively, however, students can also mimic the negative actions of leaders, which can lead to negative growth in students- thus leaders must be conscious that their actions have behavioral implications for their students. Finally, this movie clearly illustrates the transformational nature of discipling relationships- not only the character/intellectual transformation of the student, but the transformation that also occurs for the teacher. Not only does Marcus go from the nerdiest kid on campus who gets others beat up for merely hanging out with him, but Will also goes from being the guy that hits on college girls in the bar to bearing the guilt and shame of humiliation with Marcus during the school talent show. Will’s sacrifice of character in that scene has faint echoes of the sacrifice and humiliation of Christ on our behalf. This is the distinguishing factor that separates Christian leadership from other leadership types. Most corporate leadership encourages leadership that ensures the dignity of the teacher isn’t lost- that he/she maintains their power. Christian teaching, as Will picked up on, is based in serving. It requires us to get messy, to get deeply involved with the needs and desires of our students. Much like Christ had to enter into the human condition in order to bring redemption and to teach us the value of life, Christian leaders should make sacrifices in comfort and position in order to ensure the spiritual well-being of our students. Christian discipleship, then, often transforms the teacher as much as it changes the student. When we can model the love Christ has for us, it grows us and teaches us that much more about the nature of Christ’s sacrifice.